To create today’s artwork, my pal Mike Pascale masterfully mooched together elements from two different, pre-existing Last Kiss panels (See below) and put them together. Thanks, Mike! Color by Diego Jourdan Pereira. Click on image to enlarge. 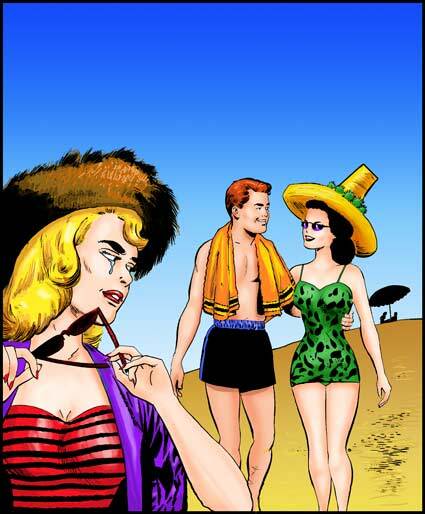 Color by Allen Freeman. Click image to enlarge. Art by the Vince Colletta Studio from the story “The End of Summer” in First Kiss #34, 1963. Click image to enlarge. 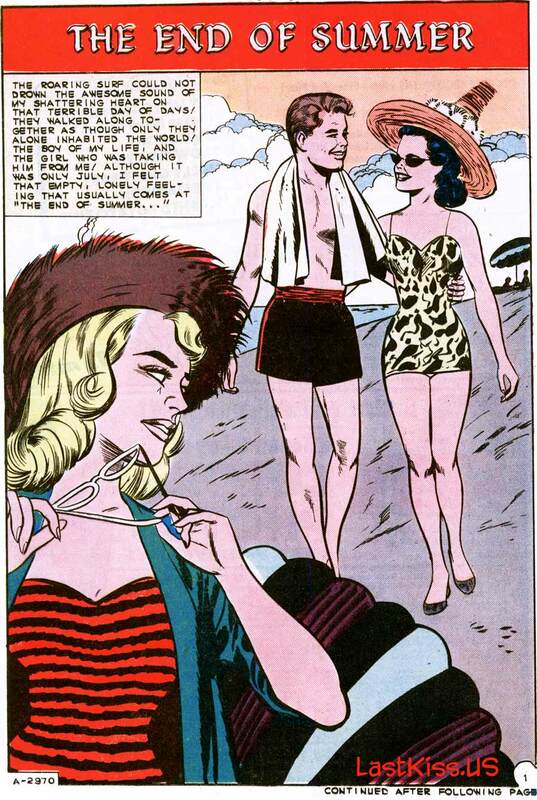 SCENE: Young man and woman in bathing suits walking along the beach. In the foreground, a man aims a rifle in their direction. 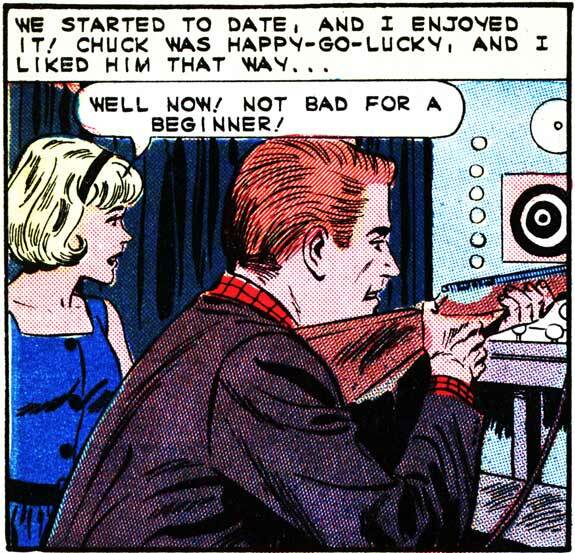 YOUNG MAN: There’s no way your dad can shoot down our engagment! MAN WITH RIFLE (thinking): Wanna bet? By the way, the color on both these originals really pops. Did you or Mr. Pascale punch it up prior to posting? Or do they just look that good in the original. Thanks. Hi, Jam. Sorry for the confusion. Those top two panels of art were scans of the line art that I then had Diego Jourdan Pereira and Allen Freeman color for me. I’ve added the original, published versions of the art below them for comparison. And, as always, thanks for the dialogue you’ve added in your comment. Very funny! 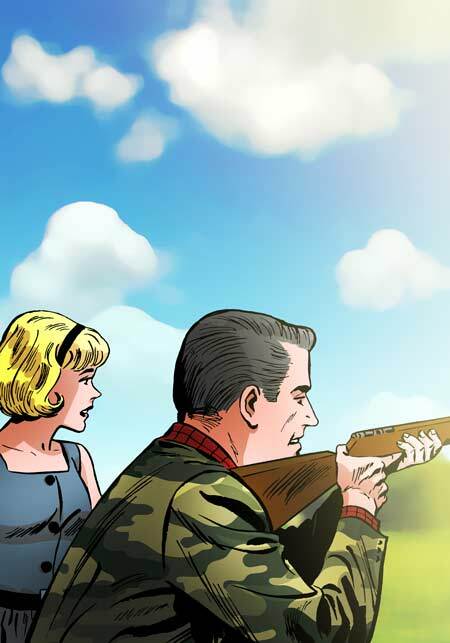 An old man had 3 beautiful daughters and a shotgun. One night 3 boys came over. The first one said,” Hi my name is Freddy, I’m here for Betty, we’re going for spaghetti,is she ready?”, and the couple goes off. The 2nd boy says,”Hi, my name is Joe, I’m here for Flo, we’re going to a show, is she ready to go?” And that couple leaves. The 3rd boy says, “Hi my name is Buck…”, and the old man shot him.